Smartwatches like the Apple Watch can do just about everything—push notifications from your phone to your wrist, send texts, and track your workouts—but they’re not as stylish as high-end analog timepieces. Tech companies like Withings have developed solutions that look like traditional watches and track your steps and your sleep, but now there’s another way to smarten up your watch: the Hot Band. The Hot Band is a leather watch strap with a magnetic closure that can be affixed to most watches, even some smartwatches. You can easily connect it to standard analog watches with a spring bar pin, including those from brands like Fossil, and it also works with the Apple Watch. When you buy the band, it comes with one of two Bluetooth fob options: a smart version, which adds a notification screen on the underside of the watch where it isn’t visible, or an audio fob, which lets you make private phone calls. The Hot Band as seen on the Pebble, analog watches, and an Apple Watch. So why would you want to swap in a Hot Band for one of your Apple Watch straps when you can already take calls from your wrist? Well, unless you have Bluetooth headphones at the ready, everyone can hear your convo from the Apple Watch’s speaker. Hamid says Apple Watch owners will want the Hot Band audio fob to make those conversations more private. And other smartwatches? They don’t even let you receive phone calls, so you might want to attach the Hot Band to a Pebble, too. The audio fob flips open from the band, and then you hold your palm up to your ear to amplify the sound. The effect looks like a game of pretend Telephone, which is a little bizzare. But in a demo last week in New York City, I heard for myself the audio quality, both when accepting a phone call and when trying to overhear Hamid’s conversation. I couldn’t hear what the person on the other end was saying to Hamid, though he was sitting just across the table from me, and it might be a solid solution for quick phone calls. The audio fob can also detach from the band and turn into a stand-alone Bluetooth earpiece. The Hot Band’s audio fob turns your watch into a phone. The audio fob doesn’t require an app, just a Bluetooth connection to your nearby smartphone. The Bluetooth smart fob that puts notifications on the underside of your wrist comes with an app, the same app that pairs with PHTL’s Hot Watch (their version of a smartwatch that came out last year). The smart fob is tiny, with 132x28 display. You tap through notifications offering up info like your step count and the weather by using a touchpad just below the screen. Unlike the Apple Watch’s notifications, which you can fine-tune to see just the most relevant information, the Hot Band’s smart fob pushes every notification that comes to your iPhone. And the notifications aren’t actionable. If you want the full smartwatch experience, the Hot Band isn’t for you. It isn’t for me, either—I never take phone calls from my Apple Watch and I don’t even own an analog one. But if you want to retrofit your traditional timepiece and get a sense of what it’s like to use a smartwatch, the band offers that experience at a fraction of the price. The battery should last longer too—the band runs for a week on a single charge, and comes with a magnetic charger). 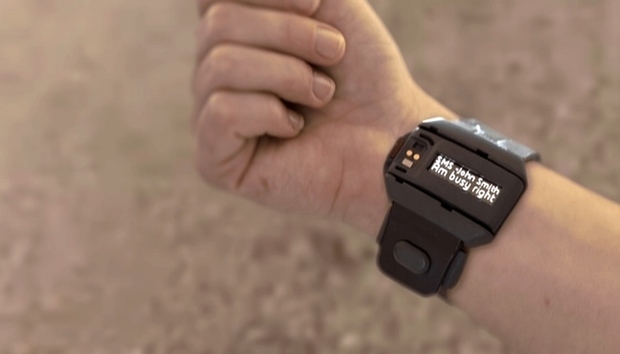 The company is raising $100,000 on Kickstarter to mass produce the band. They have fully functional prototypes ready to go, as I saw in New York. Early backers can choose between a strap and audio fob, or strap and smart fob, for $49, and the first wave will ship in May. The Hot Band will eventually retail for $119.